In his latest legacy press interview with the “failing New York Times,” President Trump had to explain the discrepancy of his views on foreign policy from his intelligence experts, who had just provided the Senate contrary opinions on Iran, North Korea and ISIS. He also felt the need to attack former Defense Secretary, Jim Mattis, whose December 20 resignation was the trigger for doubts about Trump’s policies and behavior among both domestic and foreign leaders. Of course, the Democrats, now in control of the House, especially the Armed Services and Foreign Affairs committees, are now starting to press the administration to justify their more controversial policies. Chairman Adam Smith of the House Armed Services on Thursday claimed the “acting” Defense Secretary Patrick Shanahan (see blog of Jan. 10, “Trump Likes “Acting” Cabinet Secretaries”) failed to provide transparency in his testimony earlier in the week concerning the deployment of 3,500 more troops to the Mexican border. Democrats suspect the Pentagon couldn’t or didn’t want to defend the deployment in a public setting. But, even Senate Republicans are challenging Trump’s control of foreign policy. After the Khashoggi imbroglio, 56 senators voted in December to end America’s military assistance for Saudi Arabia’s war in Yemen. Yesterday (Thursday, Jan. 31), the Senate voted 68 to 23 with Majority Leader Mitch McConnell to amend a Mideast policy bill with a warning against a “precipitous withdrawal” from Syria. 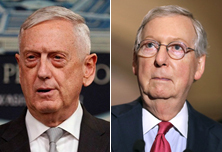 McConnell’s involvement is a direct result of the Mattis resignation, which obviously has Trump roiled; hence, his controversial effort to rewrite Mattis’ resignation into a firing (see “Mattis Resigns With a Blast at Trump’s Leadership,” Dec. 21, 2018). Can Hickenlooper Make the First Debate?